Nice weather, more daylight, and reasonable working hours have finally come together here and allowed us to get the Bakfiets out of storage and back on the road. I can admit it -- I'm a fair weather cyclist. I've kept the bike outside, but underneath a motorcycle cover (see it here). The leather saddle and seatpost stayed indoors, and the seat tube was plugged to keep any water out of the frame. 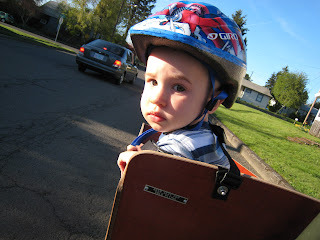 So what does 6 months of storage do to a Bakfiets? Not much. There was the tiniest hint of some mildew on the exposed end grain of the box walls, but that's about it. A little bit of bleach/water solution and some sunlight took care of that. The tire pressure, while a little bit lower than I left it, was still completely rideable. While I was doing the "tuneup," I made my first addition/customization. It's not much, just a placard from a Piper Cub instrument panel instructing the operator that solo flights must be made with the pilot in the rear seat -- an instruction that I think applies well to the Bakfiets, too. You can see it in the picture below. Everett is now 6 months older than his last ride, but he seemed to remember and was eager to climb in and take to the streets. He might look a little worried in the picture, but he was having a great time. I just happened to catch him when he was looking back to make sure mom made it safely across the street. He's talking now, which he wasn't before. Whenever we stopped, he would insist we "go! go! go!" And so we did, and so we will.